Our community is a semi-private resort-style residential development located 100 miles northeast of Pittsburgh, near DuBois, Pennsylvania. With more than 9,000 acres of wooded land and more than 2,200 homes, you will find Treasure Lake is an ideal alternative to the fast-paced life of the big city. Among the lush woods, sparkling lakes, and scenic surroundings you will find peace and tranquility living side by side with virtually every recreational opportunity imaginable. Included are two magnificent 18-hole golf courses, each with Pro Shops and taverns (the Gold Course was rated as one of the best in PA by Golf Digest), tennis courts, swimming pools, sandy beaches and much more. Families will appreciate nature trails, sports fields and playgrounds within the community. The public school system in DuBois is excellent and the crime rate is extremely low. Retirees can enjoy the many planned activities and social events, such as Sportsmen’s, Bridge, and Quilting Clubs. No matter what your particular interests are, what attracts most of our homeowners is the majestic Treasure Lake itself. This lake is designated for motor boats, has a fully stocked marina and 200 boat rental slips. Two sandy beaches line the shore of the lake where water skiing, fishing and swimming activities prevail during the summer months. Our members often congregate at our two popular restaurants, the Lakeview Lodge and Duffers’ Tavern after an enjoyable day of boating, golfing, playing tennis or other activities. We invite you to come and see why Treasure Lake is home to those who choose to enjoy a country club lifestyle without the high prices. As enjoyable as they are breathtaking, the courses at Treasure Lake are set amid the pristine splendor of the resort’s native beauty. Both of our award-winning 18-hole courses offer a restaurant, lounge and a fully-stocked Pro Shop. Our Silver Course has a great practice area and driving range. Our experienced Golf staff looks forward to helping and assisting you, in any way possible, and are very capable of facilitating tournaments and events. We have everything you need to stay on top of your game in a tranquil setting among woodlands, water and wildlife. We are located one mile off Interstate 80, Exit 101 DuBois, with many accommodations inside Treasure Lake. Treasure Lake offers several dining options within the community. From the fine dining experience of the Lakeview Lodge/Pirate’s Cove, to casual dining at Duffers’ Tavern and the 19th Hole Tavern, or outdoor dining at the Poolside Bar and Grill and New Providence Beach Snack Shack there is something for every person, couple or family. The Lakeview Lodge and Conference Center is home to fine dining with an unforgettable and vast view of Treasure Lake. Not just a fine-dining restaurant, it is a spacious, multi-faceted venue that is wonderfully versatile for weddings, conferences, private events and group or corporate meetings. Located within the Lakeview complex is the Pirate’s Cove Bar where you can enjoy the same great food, live music, and also view sporting events broadcast on multiple screens. Delicious yet casual dining can be enjoyed at either of our esteemed golf courses. Duffers’ Tavern at the Gold Golf Course and the 19th Hole Tavern at the Silver Golf Course both have a fun atmosphere and great staff to complement each menu. The Poolside Bar and Grill (Lakeview Lodge) is open seasonally, and not just for pool dwellers! With events going on all summer and fall it is a fun place to eat, enjoy a beer or a ‘specialty drink’, and take in the view of the pool and of Treasure Lake. The New Providence Beach Snack Shack caters to both residents and KOA visitors of this popular Treasure Lake beach. With a pavilion, playground, shuffleboard and volleyball courts, there is always something to do at New Providence Beach. Treasure Lake offers multiple venues in a variety of settings which are available for events, weddings, conferences, meetings and private parties. 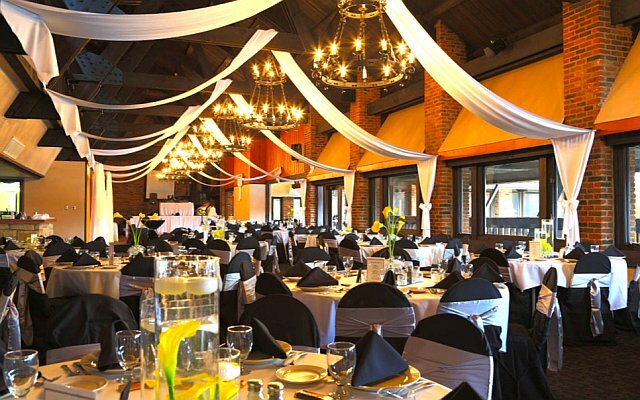 The beautiful Lakeview Lodge has multiple rooms which vary in size and has a capacity of up to 400 people, along with a great staff and support team available to customize any area to your specific requirements. All-inclusive banquet packages or full-service catering are available. In addition, the grounds are exemplary and beautiful. Treasure Lake’s picturesque scenery with a beautiful gazebo makes it the perfect outdoor wedding venue and lakeshore Wedding Venue and is also a great venue for other outdoor events. The Treasure Lake/Dubois KOA Lodge is a large facility as well, and also has a large outdoor swimming pool and a pavilion. There are a total of five pavilions across the grounds of Treasure Lake which are available for rental.